The learning of notes is an important part of the Choir’s activities. The basics of music and its secret are acquired by repetition; acting and playing; hearing; imitating and doing. Music can only be understood through personal experience. The starting point is song – singing and playing. The playing arouses the imagination and desire to act. It improves motor ability and develops coordination. 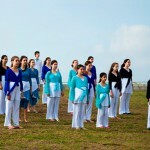 The Children’s Choir learns notes in the spirit of the Kodai method. “The singing Hand” develops the ability to sing precisely and exactingly. The method is based on agreed upon hand movements that are learned through acting and singing. Notes are learned under the inspiration of the Kodai method.